Yesterday morning I was listening to Native American olowan (Lakota for sacred songs) on YouTube. I came across some entries that included buffalo songs I’d never heard. I marked them as favorites so I could find them later. As December 21st rolls around we’ll be facing the arriving winter season, asking for help and guidance in the solstice Medicine Wheel ceremony for the cold, dark days ahead. As it turns out, the Spirit Guardian of the direction of winter, north– on the Mesa Wheel, is the great White Buffalo, “Waboose”. Maybe I need to learn a new buffalo song, I thought. Although very overcast and dark, it was such a delightfully warm day that I decided after my YouTube exploration to go for a hike on my favorite section of the Panhandle Trail not far from where I live here in western PA. My mind was still on the buffalo songs, and I found myself blowing past the trailhead parking lot and down the way along the front of a nearby farm to look for the small herd of American Bison that lives there, way back off the road. Would they be out? 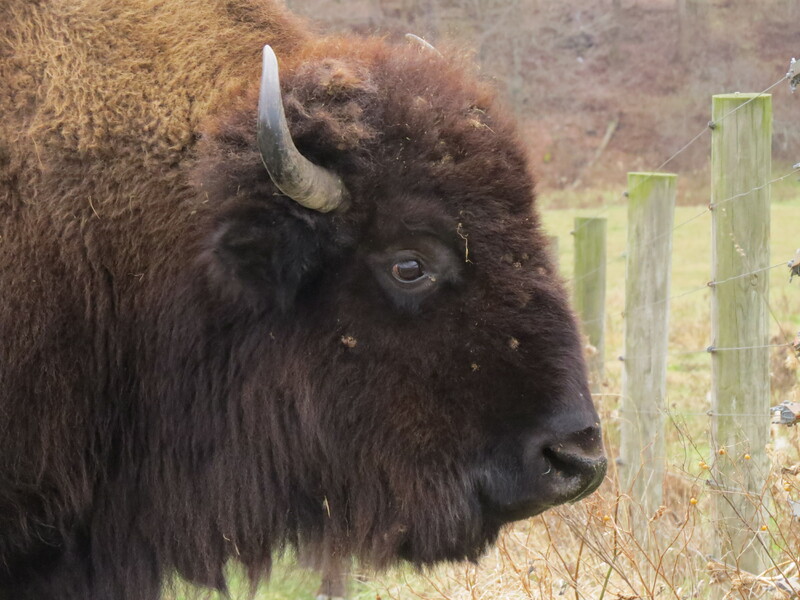 My gaze fell on the house on the farm property and I contemplated knocking on the door to ask for permission to photograph the buffalo up close, but felt great reluctance. I hemmed and hawed, squirming within about why I was being so hesitant to ask for this simple favor. Did I fear a confrontation? Rejection? Would I be selfishly intruding on their quiet Sunday afternoon? Did I imagine the inhabitants as all that different from me that they wouldn’t understand my reverence and artistic interest? Was it too much to ask for on some planet? I had no real answer. I noted that the experience I was having was a reminder that no matter how far I have come in my personal growth, I still struggle from time to time with internal conflicts and self-imposed limits. In the moment I excused myself from this low-level fear and discord, telling myself, “You never know what you’ll get when you knock on a door so far back off the road ‘round these parts… could be a shotgun up your nose!” Some part of me knew that I was standing at a different kind of doorway. At that very moment, a great blue heron flew up out of the creek just down the hill from where I stood by the side of the road. I was too startled to get a photo of him at lift-off. He’d been practically in front of me all along and I hadn’t seen him at all because– I hadn’t looked down. 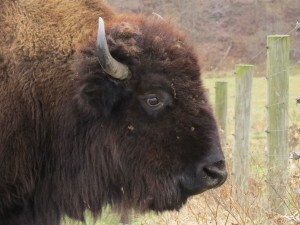 My camera and I had been completely focused on the buffalo on the high ridge. Great blue heron has been a totem of mine since I first saw one on the day of my first wife’s, funeral, 23 years and a week ago today. In my mind I can still see it rise up out of the cattails to my left on the biggest wings I had ever seen as the limo in which I sat approached the cemetery gate. To this day I remember that blue-gray bird, but have no recollection who else was in that car. I’ve always associated great blue herons with Sharon ever since, and take them as a sign of reassurance from her spirit and from Nature that I’m being looked after. I’m always excited to see them and take note of what I was thinking when I spot one. Most times I’ve seen them rise up out of a creek or pond by the side of the road, flying alongside my route. The few times I’ve seen one wading, it took flight before I could get anything like close. 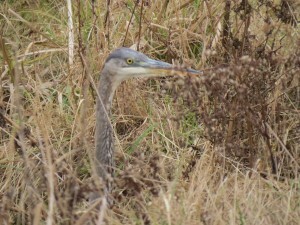 If I was lucky enough to even have a camera with me, I usually found myself standing there with my mouth open as the heron got smaller in the distance. I was struck by how startlingly similar the buffalo farm heron’s wingy takeoff and initial flight was to that mournful day long ago when I was so focused on what I had lost; my first wife and my faith in life. 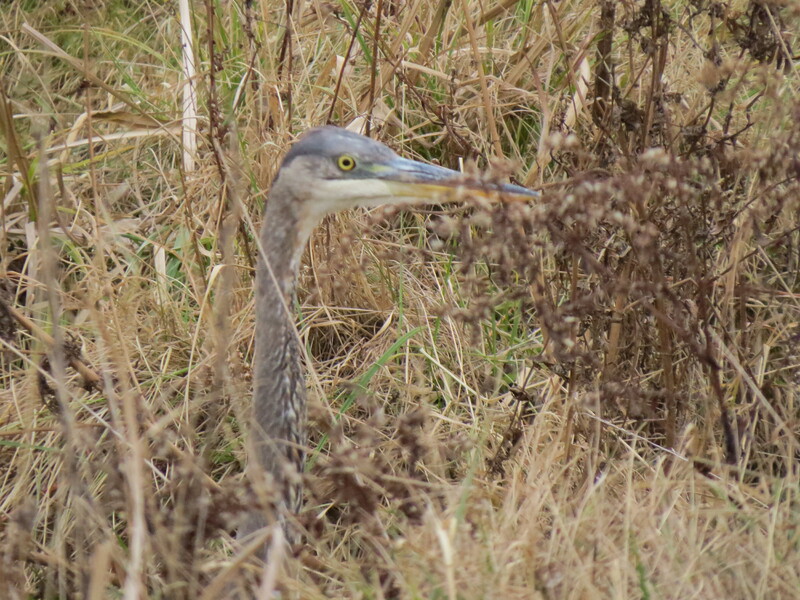 I watched this new great blue fly out in a big arc and blessed my luck when he banked and returned to land just downstream from where he started. This one came back, I thought. At that point he was watching me, but I managed to sneak the long way around and get a couple of photos before he nervously flew off again. By then I found myself quite a bit closer to the neat little house on the farm, but I still wasn’t ready to knock on any doors. I was intimidated– overawed not by some ogre but by my internal mental and emotional situation. I recognized that no one but myself was doing this to me and that it was a pattern exhibited by my mother that I continued to emulate to a degree; a brand of overwhelm before starting. Acknowledging this, I still turned away from the house and towards the car. In Animal Speak, Ted Andrews’ classic book about animal totems and what it means when they present themselves to us, it says that heron people may be “seen as dabblers”, but they are wonderful “jack of all trades”. This gives them the ability to walk their own paths (usually alone) in an intuitive way without the need to “keep up with the Joneses”—knowing they’ll be provided for. Theirs is not a structured journey by normal standards, and while it seems even to them to lack security and stability, that is just a matter of perspective. “Most people will never be able to live the way heron people do,” Andrews adds. And so I am, and sometimes lately my life looks even less stable and more insecure as I look for trail markers since my dear Kate’s passing 18 months ago. Say what you will, that heron appeared to reassure me to trust I’ll be taken care of, remind me to focus right in front of me and “be here now”– not drift off into worry about the future on some distant horizon where the buffalo roam. I walked back up on the road to return to where I was parked, grateful that I’d at least gotten some shots of the heron for my trouble. Right about then, an old pickup truck that I had seen exit the farm earlier came back again from the other direction. It slowed down as it approached and I saw the window come down on my side of the road. It was slowing down. They’d noticed me, too. “Are you looking for something?” the driver said as the truck came to a halt. 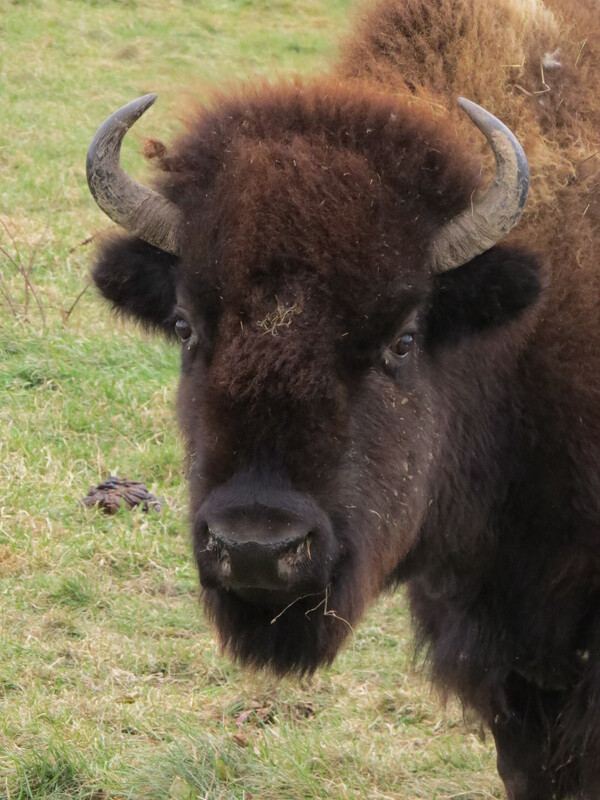 I leaned down smiling, explaining that I had stopped to photograph the buffalo I admired so much and had gotten sidetracked camera-stalking the great blue. I introduced myself and we shook hands through the window. The driver turned out to be the owner of the buffalo and invited me to come up and see them at the paddock they lived in. “Just follow us up,” he said. I thanked him profusely, scrambled back into my car once again blessing my luck, and drove up the long gravel driveway behind him. At the top the farmer’s son got out and opened a gate, graciously leaving me to spend as much time as I wanted with their five “tatanka” while they went off to check a tree stand before the start of deer hunting season. A portal had been opened for me. As I approached the paddock fence, the buffalo came cautiously closer to check me out, larger ones out front and youngsters in the back, still keeping what was for them a respectable distance and for me, photography heaven. “Uh, Brad! 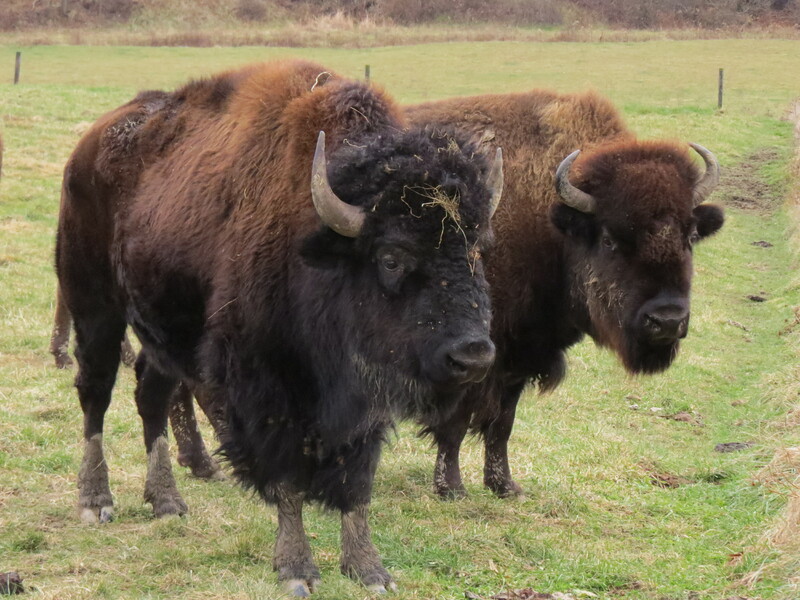 …and what does Animal Speak say about buffalo?” They’re all about “manifesting abundance through right action and right prayer,” (emphasis mine). That comes not from working hard at manifesting as many New Age gurus would have us do, but by considering our motives for what we seek to manifest and aligning with the flow and direction of the higher consciousness, love, and evolutionary intent of Creation. This is most assuredly the walk I have been on, often showing up at the right time and right place (sometimes with shaky knees) because I am willing to trust and be free-range. I was patient, polite, respectful, and engaged in right action. This is the way I live. For this I was honored by being ushered right to the abundance of the out-of-range buffalo on the too far away hill without even having to ask for it. Now I know a face behind the door of the little house on the farm and some day when the buffalo and the sun are out, I’ll brave a knock. By the way… There may still be a copy of Animal Speak floating around in the Mesa gift shop. Jus’ sayin’. This entry was posted in Uncategorized and tagged "Animal Speak", Buffalo in western PA, buffalo meaning, Free-range human, great blue heron totem, Lakota, overwhelm before starting, self-intimidation, tatanka, Ted Andrews. Bookmark the permalink.